Once looming like a post-apocalyptic fortress from a dystopian future, a self-sustaining city – an infinite urban space – was demolished in Kowloon 20 years ago this month. Kowloon Walled City, or “the city of darkness” as it was known in Cantonese, sprawled across seven acres, was home to 35,000 people (some say 50,000), packed into a few apartment blocks and more than 300 interconnected high-rises. At its most crowded, Kowloon Walled City was believed to be the most densely populated spot on Earth. Not Rio de Janeiro’s favelas, not Mumbai’s slums, nothing has ever matched Kowloon Walled City’s epic proportions. At its peak, the population density was roughly 3.2 million people per square mile. That’s like cramming the entire population of Texas into Manhattan. Such extreme conditions have sparked the imaginations of filmmakers (Bloodsport, starring Jean-Claude Van Damme), painters, writers, and even video games (Call of Duty: Black Ops). Many works inspired by the city are embellished with a healthy dose of artistic license, while others are documentary in nature. The city is shown in the raw in documentary films like visual tour de force Baraka and in the photographs of Greg Girard, who captured images for the book City of Darkness: Life in Kowloon Walled City. A number of videos from its glory days can be seen here. Some of the more fantastic artistic visions of the infinite urban space can be seen here at the Hong Wrong blog. It may seem far-fetched, but Gibson was documenting fact more than he was writing fiction, as the city’s history attests. Kowloon Walled City had its beginnings as an imperial fort in the Sung Dynasty (960-1297), and then much later, in the 19th century, as a Chinese military post. With the advent of British rule in 1898, the site became a no man’s land. It was demolished by Japanese soldiers during World War II, but then began to fill with refugees. A state of lawless limbo prevailed in the burgeoning slum. A more detailed historical account can be seen here. As Gizmodo notes, there were no plans, architects or construction firms. The makeshift city just grew organically, with rough-and-ready residents patching together improvised infrastructure along the way. Water came from wells and trash was deposited on the roof or simply pitched from windows. So tightly packed was this vertical jungle that many of the city’s labyrinthine alleyways were pitch black even during the day. The filth and crowded conditions were an ideal breeding ground for all manner of illicit trade – opium, gambling, prostitution – and the community earned a reputation as a den for gangsters, drug fiends and prostitutes. Like a Hong Kong gangster flick, the Triads ran the city throughout some of the 1960s and 1970s. Unlicensed doctors and dentists plied their trade amid the rubble. And yet there was light in this city of darkness, and a sense of community, even order, among residents. An informal kindergarten, a resident’s organization to handle disputes and even a mail service took shape. Temples were built within its walls, and factories opened to employ residents. 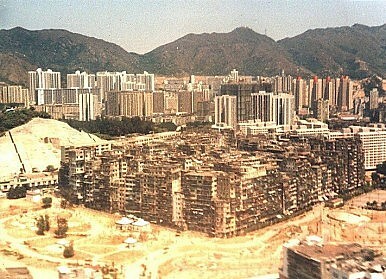 As concerns about living conditions mounted, officials finally acted in the mid-1980s, evacuating the site and relocating its residents under a HK $2.7 billion plan. The city stood abandoned like a haunted fortress until 1993 when it was razed. Today, the site is Kowloon Walled City Park, with only a bronze model of the city to remind the visitor of what was once there. But the city has not been forgotten.